This caramel apple poundcake is sweet, eggy and dense but soft. 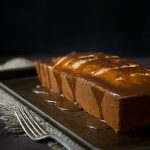 And it’s covered in a rich, creamy caramel sauce that keeps the cake moist and flavorful. Apple season has arrived! I received my first batch of CSA apples today and I’m so excited. 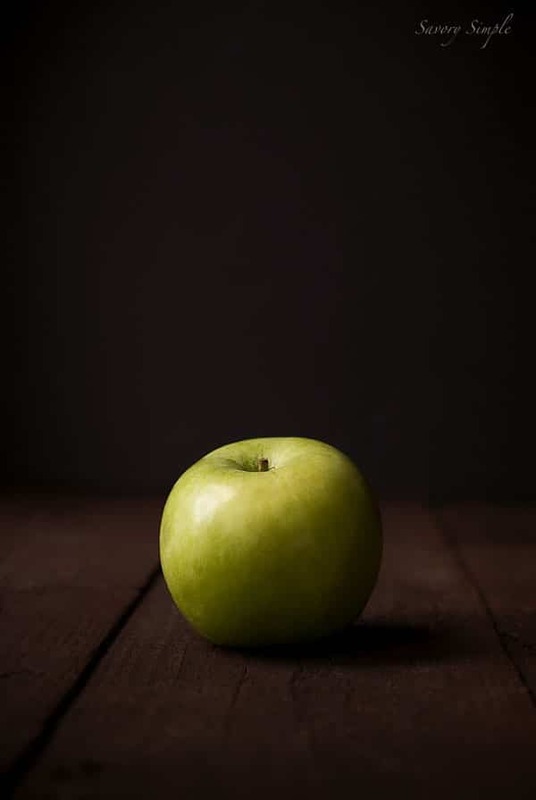 I love apples and openly admit that I buy them year round. I can’t help myself; I use them in fresh juice, smoothies, as snacks, and in both savory and sweet recipes. I’ve made them into muffins, doughnuts, fruit leather, you name it. 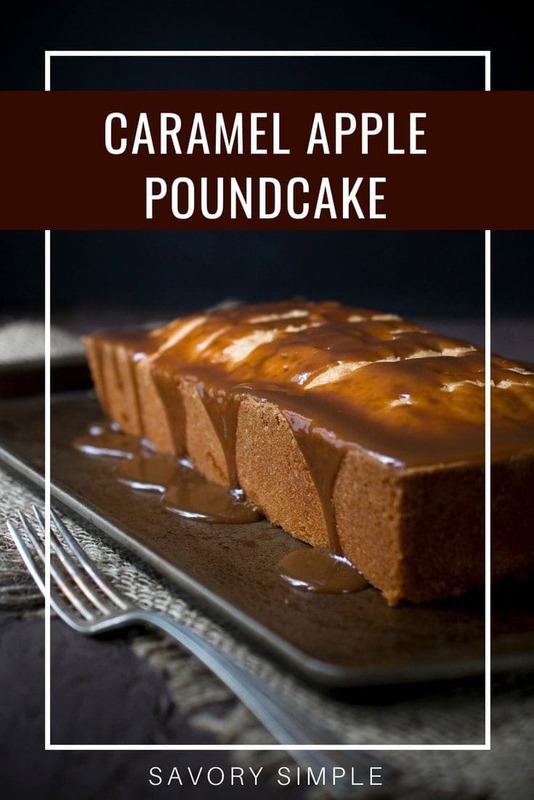 And this caramel apple poundcake is the latest addition to my apple recipe collection. It has all of the qualities I love in a good poundcake- it’s sweet, eggy and dense but soft. It has apples in every slice. 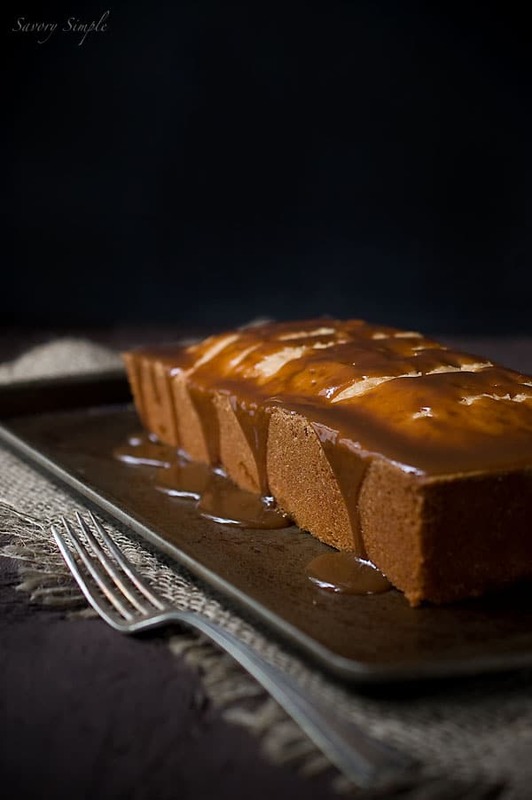 And it’s covered in a rich, creamy caramel sauce that keeps the cake moist and flavorful. I used granny smith apples in the recipe because I like the slight tartness they bring to the cake. But feel free to use your favorite apples and experiment. I only used one apple in the cake but you could probably add a second one to create layers of apple and cake. The caramel has a pinch of salt but not enough for me to call it salted caramel sauce. Feel free to ramp up the salt just a bit for more of a kick! This caramel apple poundcake is sweet, eggy and dense but soft. And it's covered in a rich, creamy caramel sauce that keeps the cake moist and flavorful. Preheat the oven to 325 degrees F and place an oven rack in the center position. Spray a 9x5 inch loaf pan with baking spray (or use butter) and line the bottom with parchment paper. Whisk the flour, salt and cinnamon together and set aside. In a stand mixer with the paddle attachment, cream the butter and sugar together on high speed until light and fluffy, approximately 5 minutes. Scrape down the sides of the bowl and mix on high speed for another 30 seconds. Turn the mixer speed down to medium low and add the eggs and yolks, one at a time, allowing them to incorporate completely before adding the next. Scrape down the sides of the bowl, add the vanilla and brandy and then mix again until everything is just combined. On low speed, add the dry ingredients in 3 batches and mix until the batter is just combined. Peel and core the apple, then slice it in half from top to bottom. With the flat sides down, slice each apple thinly. Spread a small amount of the batter into the reserved loaf pan. Layer the apples in the pan, overlapping each other, until the bottom of the pan is covered. Pour in the rest of the batter and smooth the top with a spatula. Bake the poundcake for 70-75 minutes, or until a toothpick inserted into the center comes out clean. Allow the cake to cool for 5 minutes in the pan and then gently flip onto a cooling rack. Allow the cake to cool to room temperature. While the cake is cooling, prepare the caramel sauce. Add the sugar and water to a medium saucepan and bring to a boil. Reduce the heat slightly and simmer until the caramel reaches a dark amber color. Do not walk away; caramel can go from perfect to burnt in a matter of seconds. Add the cream and quickly pull your hand away because the mixture will splatter. After a moment it will calm down. Stir with a heat proof spatula or whisk until the sauce is smooth. The sugar may seize up at first which is fine; just keep stirring over the heat. Add the salt and allow the sauce to reduce, while stirring, until it reaches the desired thickness (5-10 minutes). Before serving, drizzle the caramel sauce over the cake. A pleasant surprise. I’m impressed !! Only a few more weeks left in New York We love our apple orchards. I love pound cakes more than anything else! Pinning this. Thank you. GORGEOUS photos. I love this so much. Heavens, this is absolutely amazing!! All of my favorite things in one bite. Ahhhh caramel and apple.. That combo is what my dreams are made up of. So yummy. Yum! I love Apple season! Caramel apple anything is good!! Love this flavor for a pound cake! This is really making me drool! Makes me so excited for more apple desserts! This looks divine! Can’t wait for a slice! Oh yes please! This looks amazing!